Located in the heart of the Vendée, Camping Riez to Life **** - Maeva Camping in Saint Hilaire de Riez welcomes you in a friendly and warm for a successful holiday! This campsite is less than 1km from the beaches bordered by the Atlantic Ocean. Near a forest that separates it from the beach facing the Ile d'Yeu, this place is a typical Vendée holiday resort surrounded by landscapes as enchanting as picturesque. You will also appreciate the infrastructures and activities thought and organized for the happiness of each of you. - Exterior with a heated swimming pool of 200m², paddling pool and 2 giant slides of 33 and 23m long and up to 6m high for thrills guaranteed! Although calm and tranquility are the key words of the campsite, activities are not lacking! Throughout the season, sports tournaments, fitness classes, petanque competitions, happy hour and theme nights ... accompanied by warm and dynamic animators. Some days, you can enjoy a circus that comes to your home and even participate the public! The campsite also offers teen dates in July / August for children 13/17 years old. 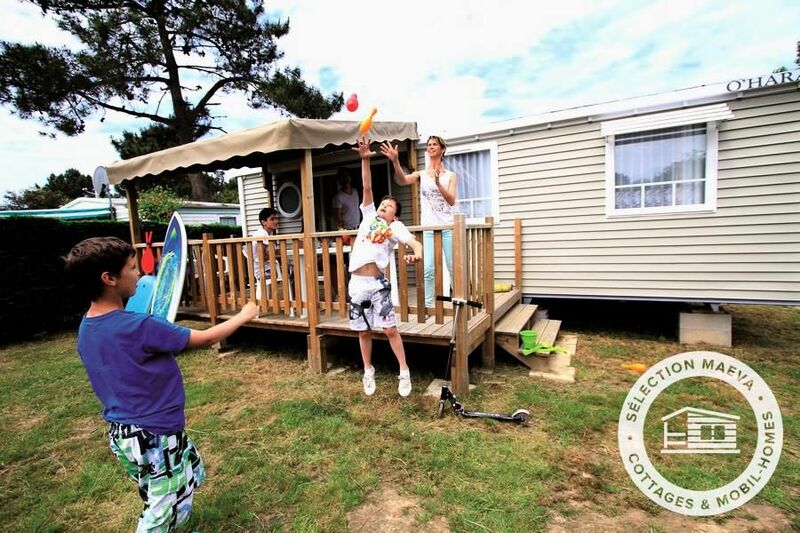 Make the most of your stay at Camping Riez à la Vie to discover all the activities offered by the region. The latter offers many activities such as theme parks: Puy du Fou, Futuroscope and the zoo of Les Sables d'Olonne. You can also go sailing, hiking or horseback riding, bike rides, golf and many other sports practiced in the area. Mobile Home 4 rooms for 6 persons of 30m ² approximately, composed of a corner living room with a bench, a corner cooks equipped, a room with a double bed, 2 rooms with 2 single beds each, a room shower, separate toilet and a covered wooden terrace. The Mobil Home includes a lounge area with TV, a kitchenette equipped with gas hob, fridge, microwave, cooking utensils and crockery adapted to the number of people in the accommodation. The terrace has a garden furniture and 2 sun loungers. Pillows, mattress covers and blankets are provided for each bedding (optional sheets). Highway A11: Paris, Le Mans, Angers, Nantes direction Bordeaux-Saint Philbert of Grand Lieu then Machecoul, Challans, Saint Hilaire de Riez. At the roundabout located at the place called Le Pissot, follow Saint Hilaire de Riez. At 2 km, at the roundabout, turn right Saint Hilaire de Riez center.